Let’s face it: if we were to buy every survival item we read about online or in books, we’d have to spend dozens if not hundreds of thousands of dollars on preps. That’s a lot of money! Prepping and living frugally go hand in hand and it was only a matter of time after I started prepping myself that I started to look for ways to minimize my expenses. In what follows I want to give you nothing but ways to save money prepping, starting with the obvious ones (that you may already know) and finishing with the ones that may surprise you. All that clipping can really help you save money prepping. Don’t forget to look for coupons online, too. Couponing is an art and it has its own tips and tricks that are out of the scope of this article. Here is one that delves a little deeper into couponing for preppers. Another obvious tip but here’s the not-so-obvious part. Start your bulk buying efforts with things you know you’ll consume anyway in a reasonable amount of time. What I mean is, it makes more sense to buy a lot of floss instead of a one year supply of beans because you can start using it instead of just looking at it. This is a great way to get your feet wet with bulk buying. The subtitle should actually read: make survival food part of your daily diet. That way you’ll never throw away a single ounce of food that could expire if you don’t eat it in time. In fact, a lot of survival foods do expire before you expect them to, particularly if they’re not stored right. This, of course, has the side benefit of you and your family getting used to survival food, trying out different brands, comparing prices, taste and so on. Preparing meals from your stockpile helps keep it fresh and get your family used to the foods. Raw ingredients also allow for versatile cooking. You can change the seasoning and add new ingredients to a dish to pack in more nutrients and cater to your family’s tastes. When investing in stockpile of food, you will want to protect your investment. Take into consideration the shelf life of your preps and start collecting those that will last the longest. The most common are rice and beans and for good reasons. They are inexpensive, have long shelf lives, and are relatively easy to store. Here are general guidelines for basic foods and how to store them in order to make them last as long as possible. Because of the broad range for most foods, it’s important to also know what to look for to make sure the food is safe to consume. Watch out for cans that appear bloated or rounded on top. This is caused by gases released during decomposition and means that the food is spoiled. Also avoid cans that are rusted or leaking because once the seal is lost, the food will spoil. Proper storage techniques will help your bulk foods stay fresh longer and help you save money prepping. In dried foods, like grains and beans, check for insects, mold, and fungus. Color and smell are also good indicators- if you open a can and see brown spots or catch a whiff of an ammonia-like smell, do not consume the contents. Spoiled food should be discarded immediately and the container cleaned thoroughly to prevent spreading to other parts of your food supply. Just because a brand is reliable and has lots of reviews, that doesn’t mean you can’t get a better deal somewhere else. There are always small brands that offer competitive prices as a way to get a slice of the marketplace. All you have to do is find them, do your due diligence and get the one with the best price / quality ratio. Make sure you compare equal quantities when looking for the best deals. Also, many sites offer free shipping for orders over a certain amount. Research can take a lot of time but, hey, if you don’t have the money, you have to compensate for that with time. Fortunately, you can do most of this online. If you already have your 3 week emergency food supply, maybe it’s time to consider upgrading your skills or fitness level instead of going for a 3 months’ supply. These will be extremely important when disaster strikes and it’ll give you a chance to “delay” spending more money. Working on your outdoor survival skills is time well spent. Honing your camping skills, like fire-making, shelter building, and outdoor cooking can all be done in your backyard at little to no cost. Put down the matches and try different ways of starting a fire from natural materials. For six fire-building methods to practice, CLICK HERE. Spending a day in the backyard building a shelter is a fun way to teach your kids this important skill. There are many types of shelters that are simple and provide protection from wind and rain. Top off the day with cooking dinner over an open fire and you will have practiced three major survival skills without spending a penny. Click to learn more ways to increase your self-sufficiency! I’m talking about things around the house such as chicken coops, solar panels, fences, safe rooms, nightstands, furniture – you name it! This can be really fun, particularly if you involve your children. Get out your tools and start building! The same goes for home repairs. Learn the basics of carpentry, plumbing, and electric work through hands on experience in your own home or helping out friends and family. Take advantage of opportunities to acquire new skills by volunteering in your community. Practicing home repairs will keep your skills sharp. You should also keep in mind these DIY skills are going to be golden post-collapse when everyone’s going to want to fix their homes. Well, as long as everyone’s buying in bulk, why not trade stuff so you can all be more prepared? You can increase the variety of your preps while still taking advantage of bulk prices. This will also be a very good lesson about how bartering works. Trading skills can also help you become more prepared. Maybe your neighbor is great at canning vegetables and you’ve mastered building a Dutch oven. You can both benefit from each other’s knowledge. Learning from someone with experience can shorten the time it takes to acquire a new skill. Trading skills and services is a great way to save money prepping and get work done while you do it. If you’re afraid to make mistakes or if you want to be prepared for a 3 day emergency ASAP, you’d have to make a lot of compromises: buying MREs, getting a backpack with a non-metallic frame and on and on. When you avoid buying overpriced stuff, you save money long term because you’d eventually have to buy the real deal sooner or later (not to mention a quality tool can last you a lifetime). This will obviously save you money on gas, it will help you lose weight as well as tone up. Tip: instead of carrying your groceries home in bags, put them in a backpack. This will be excellent practice for when you’ll be bugging out with your BOB. Don’t lose sight of the goal: to prepare your family for survival during a crisis situation. That may mean making substitutions for expensive items or repurposing items you already own. Garage sales can be a gold mine of camping gear and other useful preps. Keep an eye out for businesses that may be getting rid of unwanted items that you can repurpose. A little creativity can go a long way. Well, those were it. Can you think of more ways to save money prepping? Let us know in the Comments section below so we can build the biggest money saving list pertaining to survival there is! And if you’re looking for something a little more structured, I strongly suggest your read my article on the basics of prepping right here. Now that you’ve read all of our articles on gathering preps (And learned to save money while you do it! ), it’s time to find a good place to stash your stuff. We aren’t all fortunate enough to have a multi-acre compound with a series of concrete bunkers to store our hard-earned gear and preps. With 80% of the United States population residing in urban areas, there’s a pretty good chance that you’re in an apartment or smaller house without a bunch of property or storage space. Let us show you how to store all of your preps effectively without cluttering up your entire living area. Think about packing up your BOB. When you spread everything out on the living room floor, the equipment seems to take up the whole room. Somehow, though, it all fits into that 35L pack. The same Tetris skills that make this little miracle possible can be utilized for large-scale storage all over your home. It’s all about considering the space and finding the most effective way to utilize it. Put away the Gameboy; this is for real. When storing food and water, make sure to consider any concerns related to spoiling. Water stored in plastic containers shouldn’t be left near heaters or in sunlight, so as to reduce leaching of the plastic into the water. Food should always be boxed in pest-proof containers. The last surprise you need when hiding from the roving hordes of zombies is to break out your Pasta Sides and find them full of little worms or mice. Protein’s a good thing, but emotional distress far outweighs it. Consideration should be given to storing firearms, medical preps, and edged tools. Think about local laws and the likelihood of underage visitors getting their mitts on these items when you’re squirreling them away. Think about how much stuff you have that you never use. Getting rid of those extras not only frees up space for preps, but gives you an appreciation for what you can live without. If it comes time to break out those preps, that ability to survive without every possible amenity may just come in handy. Wouldn’t it be nice! Fortunately you don’t NEED acres of property to get prepared. Image from Lee Cannon. Take steps to get all your stuff squared away in your little space. Pay attention to these quick tips, and you’ll be well on your way. 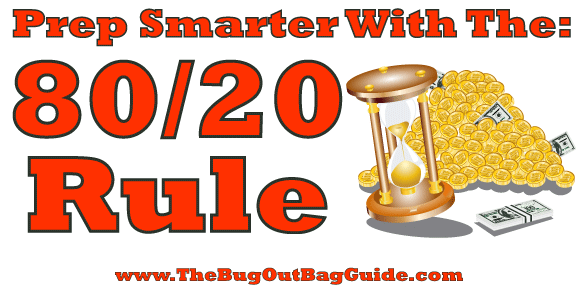 On this site we’ve covered go bags, BOBs, INCH options, and bug-in preps. While these all have their applications, they don’t all need to be stored in the same place. For instance, you may want your go bag or BOB to be pretty handy in case of some quick emergency: A fire, tornado, or local riot. Bug-in food or medical preps, on the other hand, can be tucked away in a spot that doesn’t require quick and easy access. Consider the convenient dead space in your place. Most BOBs will easily fit under a rack of hanging clothes or next to the vacuum in a closet. Since you see it every day, you’ll know exactly where your bag is in the event of a “get out quick” emergency. Having your BOB easily accessible can also encourage you to think about your preps more often and trigger you to remember to replace those old batteries, toss in some zip-ties, or check the expiration dates on food packs. Beat the challenge of apartment prepping by filling empty spaces, like replacing the box spring with food storage buckets as seen on Prepared Housewives. For long term preps, find all that real hidden storage. While it’s a fine idea to break up your preps into small caches, be sure to keep each cache complete enough to hold you for a day or two. For instance, don’t store a couple cans of food alone in a desk drawer. If you have an entire desk drawer that can be utilized, instead use it to store a large FAK, flashlight and batteries, and a radio. If you don’t have any shelving or other storage options above shoulder height, you’re missing out on about half of your storage space; but you’re sure not paying half the price! Tall, narrow shelving units are the bee’s knees for storing preps in small spaces. Most closets have space on either end that isn’t quite right for clothing, but is certainly wide enough to stack preps in narrow shelving units. If you’re not opposed to the appearance, don’t forget about those hard-to-reach spots on top of your cabinets either. First ensure that there’s a good solid board or two for everything to rest on up there, then pull out your stepstool and start stacking. The amount of canned food and bottled water that can fit in the two feet between a cabinet and the ceiling will astound you. Storage boxes are a great way to utilize space above cabinets when apartment prepping. Image from Thrifty Fun. Boxes and bins are easily stackable, move and slide around with minimal effort, and are a great way to organize preps and gear. Check out your local big box store; for less than a Benjamin you can bring home all the storage options you could ask for. Look for the skinny plastic storage bins designed to fit under a bed; these are great organizers. If you’ve already thought of this for storing winter clothes and Christmas presents, try pulling your bed out from the wall 8-12 inches. The gap to the wall provides a huge amount of storage space for stackable goods without detracting much from the overall room layout. The same thing goes for couches, chairs, or entertainment centers. Alternatively, fill up some decorative baskets or trunks and hide your stuff in plain sight. That idea crosses over to filling up empty suitcases, shoe boxes, or dresser drawers. Get the most bang for your storage buck. For food preps, think high-calorie, nutrient-dense food. Soups are cheap and tasty, but don’t have the caloric density of canned meat or protein bars. Noodles are a great idea, but rice has just as many cooking options and is wildly more calorically dense and easy to store. Make the best of your space by choosing nutrient dense food items for your apartment preps. Anything that can be made smaller should be. Putting clothes in vacuum-sealed bags can reduce their bulk by three-quarters, while at the same time making them more manageable to stack or stand vertically. Rolls of paper towels or toilet paper can be squished flat. Many new items come in bulky and difficult-to-arrange packaging. If it’s not going to spoil, pull it out of the packaging; just remember to save any necessary directions! Storage facilities, family farms, and other off-site storage facilities can be pretty tempting options for apartment prepping. Before committing to these, consider the reality of your situation. For one, do your preps really require that much space? Are you sure there’s not some more room at home? Also take into account the difficulty of getting to your storage location in an emergency. If it’s not an easy walk, it might not be a good solution. If your apartment comes with a separate storage area, use it. Just don’t use it for preps! Keep in mind that even if it’s tough to see into, these storage areas are rarely particularly secure. In the case of an emergency where you’ll be using your preps, you’ll likely be quite vulnerable while you’re making trips back and forth with all your stuff. Consider using that storage space to hold other excess from your apartment, thus making room inside for your valuable preps. For more info on bug-in supplies, CLICK HERE. Even if you’re in a small house with limited property, you likely have a lot more options. Attics, crawl spaces, under-stairs spaces, and garages all present a multitude of storage options. Stick with the rules above; they’re still applicable. It can’t be stressed enough to go with lots of shelving. Also think about the hidden storage in guest or spare rooms. Before you get too excited about your attic or basement, do be wary of the heat that can build up in attics and the moisture that can accumulate in basements or crawl spaces. An attic fan or a dehumidifier or silica desiccant cartridge is a great investment for keeping unwanted heat or moisture away from your preps. If you have a yard or private outdoor space, don’t dismiss the idea of outdoor storage. 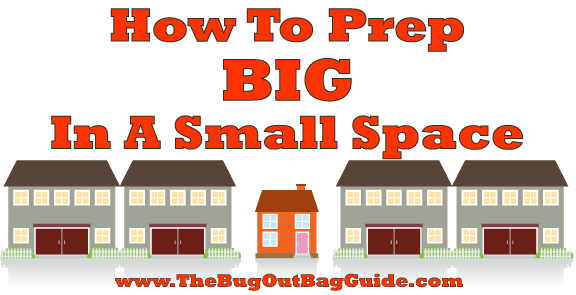 While leaving things piled under a tarp probably isn’t a very good scenario, small storage bins or outbuildings are relatively inexpensive and can be tremendous space multipliers. As with apartment storage units, consider moving yard tools and excess house junk into these spaces and leaving the preps safe inside. Hopefully this has given you a few ideas and some inspiration to get cracking on storing your preps properly. Do you know of any good spots we’ve left out? What do you do to maximize your small space? Let us know in the Comments section below.